In 1559 Metropolitan Neophytus of Constantinople, on his journey through Volhynia, visited the noblewoman Anna Goiskaya living at the estate of Orlya, not far from Pochaev. As a farewell blessing he left Anna an icon of the Mother of God which he brought from Constantinople. They began to notice a radiance coming from the icon. In 1597 Anna's brother Philip was healed of an ailment before the eyes of a monk who lived on the hill at Pochaev. She then gave the wonderworking image to the monk. 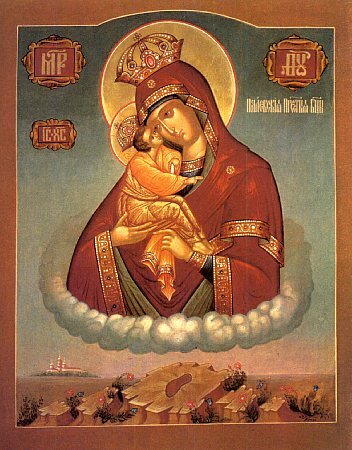 The icon was placed in a church which was built in honor of the Dormition of the Most Holy Theotokos. A monastery was later established there, and Anna Goiskaya provided a large portion of the money needed for construction. O Victorious Leader, who has chosen the Pochaev mount as your habitation. We, your servants, sing our grateful thanks and praise to you, O Theotokos! As you have since ancient times glorified this godly place through the appearance of the healing power of your footprint and your wonderworking image. Rejoice, O Praise of Pocahaev, our hope and consolation!